May is considered the merriest month of the year in the Philippines. The month usually ushers in the end of the summer season and the start of the rainy season. Flowers also come in full bloom on this month that's why we the traditional Flores de Mayo or Flowers of May. It is the month of the " Santacruzan" a procession or pageant depicting the finding of the Holy Cross by Queen Helena, mother of Constantine the Great. This is participated in by the fairest lasses in town, representing various characters associated with the Virgin Mary. They are dressed in beautiful gowns sometimes even with a tiara, and walk along the main streets of town with their escorts under bamboo arches decked with the flowers of May. The highlight of the parade of course is Reina Elena (Queen Helena) who is escorted by a young boy or Principe Constantino (Prince Constantine). They are usually followed by a carossa bearing the image of the Holy Mother and after this, a band playing music in honor of the Virgin ends the parade. Traditionally, the procession ends in the parish church where the lasses offer the flowers they bear to the altar of the Virgin Mary. After this, a trellis made of bamboo hung with candies, sweets and other goodies, is hoisted up the air. The 'pabitin" as it is known is slowly lowered to allow the children to get the goodies attached to the trellis. The Santacruzan usually serves as the culminating event of a town fiesta. Another influence of the Spanish, fiestas are celebrated all over the country to celebrate the feast of a particular saint. Each town has a patron saint and every year, townsfolk fete theirs with festivities and lavish food not different from the Roman feast of Bacchanalia. Fiestas usually last for only one day but certain parts of the country celebrate theirs for almost a week. When I was younger, the sure sign that the fiesta is coming is when a perya opens in a vacant lot near our church. It resembled a carnival but only smaller. Every night the perya operated games, raffles and of course, freak shows. 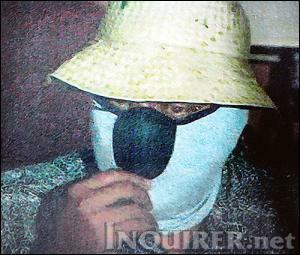 One freak show that stuck in my mind was the taong gubat or the wild man who ate a live chicken. I watched in awe as the man grabbed a live chicken from the emcee and started gnawing its flesh. My belief on the taong gubat was lost days later when my friends and I went to the vacant lot to catch dragonflies only to find the wild man doing laundry. These days, the perye is rarely seen in the city. Seeing one is like seeing an old acquaintance that's been missing for years. Just this week, the place where I grew up celebrated the feast of its patron, the Holy Trinity. The fiesta in our place was usually a big deal. The streets were usually decorated with colorful streamers weeks before the actual feast day. We wake up on the feast day itself to the sound of drum and bugle bands playing music while marching through the main streets. Almost every house prepare sumptuous meals, which were openly served to guests. My friends would go to each other's house to eat until we have our fill. This year though was different. There were no more marching bands, instead street dancers were going from house to house asking for donations. Only a few homes in the neighborhood even bothered to prepare food. In fact, the only streamers in the streets were the ones put up by the candidates in the last elections. Perhaps these were just a reminder that times are indeed changing fast. We were at the Ayala Museum last Sunday, my first visit after my last one decades ago. I was pleasantly surprised to see the many changes since the last time I was there. The building for one looks more modern and blended in its surroundings, which is sad to say a mall. We began our tour at the fourth floor, as advised by the staff at the front desk. The current exhibit there is called Crossroads of Civilizations featuring Philippine treasures from the past that prove the country's contact with other cultures from Asia and Europe even before the arrival of the Spanish conquistadores. My favorite is the one called "Gold of Ancestors" which includes more than a thousand gold objects from pre-colonial time. Ladies who love this precious metal should see this one but must also be forewarned that it might cause a mild case of envy. The objects include ear decorations, necklaces, bracelets and other various body adornments used by the elite of that period. One of the more interesting pieces is a "body belt" worn by a male member of the elite. It is a rope like object made purely of gold where one end is worn on the wrist. By the way, before proceeding to the displays, one has to watch a video presentation that gives background information to the exhibit. It's a short presentation but it's well made and worth watching. The "Embroidered Multiples" exhibit features rare Filipino garments from the 18th to 19th century. These include silk trousers worn by elite Filipinos and delicate looking woven blouses with intricate embroidery. Most of the pieces came from Leiden National Museum of Ethnology in Netherlands, which got it from a French diplomat who worked in the Philippines in the 19th century. Here's where the story got interesting. According to the video presentation in the exhibit, the collection stayed in the vaults of the Leiden museum for more than a century until a Filipina doing a doctorate thesis got interested in them. The curator of the museum believed that the Dutch did not get interested with the pieces because they are "Western" and they prefer the more exotic costumes worn by natives. The "Millenium of Contact" serves as a proof of trade between the Philippines and its neighbors in Asia. It showcases ceramic trade items like plates, bowls, and small ornamental figures from China and Southeast Asia that were found in the Philippines. Most of the articles were from private collection of the Grau sisters who came from Davao. The Museum's third floor features the art collection of Purita Kalaw-Ledesma who was a patron of the arts and founder of the Art Association of the Philippines (AAP). The collection includes paintings, sculpture, and mixed media works of Philippine art masters such as Vicente Manansala, Carlos "Botong" Francisco, Ang Kiukok, Onib Olmedo and Cesar Legaspi, among others. There was also a special exhibit of Claude Tayag's interpretation of the Stations of the Cross where the artists used poles to represent Christ and other human figures. Our next stop was the second floor and the first thing to see there is the Maritime Vessels exhibit which showcases models of the different sea crafts that plied the Philippine seas in the past. But the main attraction on this floor are the Dioramas depicting 60 important events of Philippine history. I was still in grade school when I saw this dioramas for the first time and I was very impressed with it. It's still impressive not only because of its theme but also now, I could appreciate the craftsmanship that went in the creation of the figures. For 100 pesos, museum guests can rent an audio device that can be used while viewing the dioramas. The exhibit ends with a multimedia presentation of events leading to the People Power Revolution of 1986. During our visit, there's an exhibit at the museum's ground floor called "El Prado Project: Dialogue with the Masters". The project asked contemporary local artist to re-interpret works of Spanish masters that are part of the collection of the El Prado Museum. It was already the last day of the exhibit last Sunday. I truly enjoyed our visit to the museum but I realized that one afternoon is not enough to immerse in the rich heritage of our country. The museum deserves another visit from me. Hopefully, more Filipinos would enjoy the museum. There were several families when we were there but there were more foreign visitors. Tickets are more almost as affordable as movie tickets. Adults pay 225 pesos each while kids and senior citizens pay 125 pesos only. This already gives access to all the exhibits. The Ayala Museum is open from Tuesday to Friday, 9a.m. to 6p.m. and Saturday and Sunday, 10a.m. to 7p.m..